We spend so much time in our cars these days that if we don’t watch how we do things they can easily become overtaken by kids toys, snacks, baby items, snacks and yes, even the occasional lost shoe. It can be even worse if you travel a lot. Organizing our cars is the one thing that we all say that we’re going to do, but never do. Me included! It seems to be always last on my to-do list until I finally decide to make it a priority. Fortunately, since it’s such a small area, it doesn’t take too terribly long to set up. 1. Use a backseat car organizer. If you have kids, you’ll want to make sure that you’re corralling their stuff from the moment they sit down on the seat to the time they get out. Using an over the seat organizer can help with this tremendously. Make sure that the one you get has plenty of pockets for their toys and things and that the organizing can easily be reached by them when they’re buckled in. If you have more than one child, consider putting one on each of the front seats. 2. Cover your seats. To cut down on messes and protect your seats caused by leaking sippy cups or little hands dropping their Cheerios, place a vinyl seat cover over the seats and under any car seats or booster seats. This will make it easier to wipe off the messes and keep things unsticky. 3. Don’t forget the trunk. For your trunk, look at installing a trunk organizer or at the very least, putting an empty tote back there. This will help with a couple of things. One the tote can be a catch-all for things that you need to corral easily. Second, if you have things you need to carry into the house, you can toss them in the tote and go. Just be sure to put it back once you’re done. 4. Stow only the important stuff in your glove box. Your glove box should be cleaned out every few weeks too. Ideally you should only have important papers related to your car (registration, insurance, etc) and a small notebook with pen kept in there. Make absolutely certain that it’s not cluttered with old fast food napkins and the like because if you need to find those papers, you won’t be able to. 5. Designate a place for garbage. To cut down on trash in the car, reuse plastic grocery bags as trash cans. You can hang them from the edge of the radio knob or the edge of the glove box and then just toss the entire thing when you’re done. 6. Make your vehicle smell fresh. Take a thicker (and small) piece of cloth or tissue and add a few drops of your favourite essential oil onto it. Place it into one or two of the vents of your car. When you run the air conditioner or heater, the oils will blow out into the car freshening it! (Just keep in mind that the heater will use the scent quicker since heat destroys essential oils). Keeping your car neat and tidy doesn’t take much work at all. You do, however, need to maintain it. Otherwise, you may find yourself right back where you started. It’s like any room in your house though. Maintenance is the key to keeping it clean and organized! 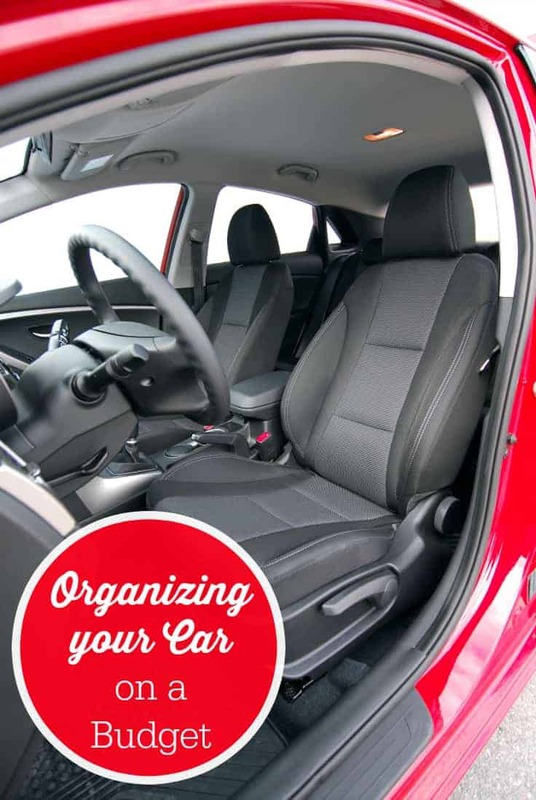 How are you at keeping your car organized? I am very good at keeping my car organized, but may throw a small box in to corral the washer fluid and cat litter bottle (for winter driving). I always find myself throwing everything in the trunk of my car… It ends up being the black hole or void; I do have to find a trunk organizer. Any recommendations? My trick for the garbage, we take a Tupperware container that you would typically use for cereal and place a grocery store bag in there to collect garbage and then empty as needed. It gets placed on the floor of front passenger seat and since I drive, my husband just takes garbage from the kids and puts it in there. Keeps the smells and mess down as just need to open up the little lid to put stuff in and it’s all contained!